What would I do for a Klondike Bar? Well, I certainly wouldn't make out with someone unsavory. I definitely wouldn't sit through any Robin Williams movies or burrow into any badger dens. But I would absolutely take some money out of my purse and buy a Klondike Bar if I were craving one. I do have money. And if I wanted a stupid Klondike bar, I would most likely just pay for it. It's way easier to just do that than run through a jungle filled with bears. I mean, it's not like Klondike Bars are something rare that was lost in a shipwreck off the coast of Madagascar during the 15th century. They weren't buried with Jesus and resurrected on the third day. People didn't pan for Klondike Bars during the Klondike Bar Rush of 1849. So, why do the Klondike people act like I have to go to all this effort to have one? In a grocery store, the freezers tend to be all in one central location. All you have to do is find the frozen foods aisle and follow the Blue Bunny to the Klondike Bars. You don't even have to know how to read. Just look for items that don't have a stick, reach in, grab a package, retrieve your arm which is now holding the package, and then go to the cash registers. It's all pretty straightforward. Open that folding leather thingy, take out the green pieces of paper, and hand them to the person operating the thing that makes loud noises and spits out the drawer at the end. After you do that, you can have, not one, but an ENTIRE PACKAGE of Klondike Bars. And you didn't even have to do anything stupid to get them. 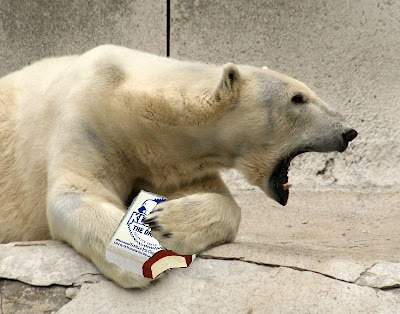 Now, if the makers of the Klondike Bar really wanted to give people a challenge, might I suggest some kind of obstacle course including an actual live polar bear? Then, if someone were asked "What would you do for a Klondike Bar?" the person could wave a handless stump around as proof that he or she really likes Klondike Bars that much. Then and only then can I fully appreciate the splendor of a Klondike Bar and perhaps consider having one. But for now, I'm just going to have a popsicle and wait for the Klondike people to make it worth my while. I would just like to say that I'd do some downright NASTY things for free healthcare and only free healthcare, perhaps for a nice house in Jamaica Estates too, but dammit that's where I draw the line. Or maybe just wing someone.